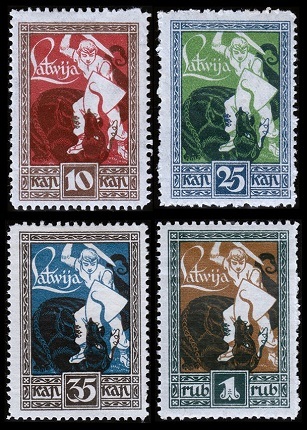 The commemorative Latvian stamps issued between 1919 and 1920 celebrated important events in the brief history of the republic. 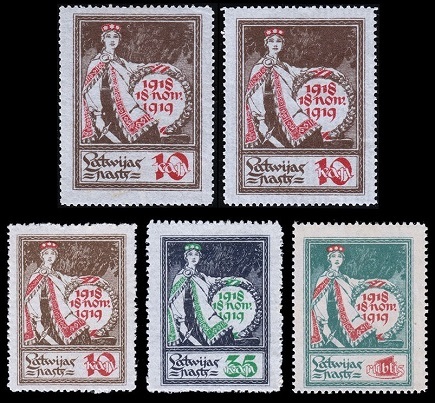 The five commemorative stamps shown above were issued on November 18, 1919 to celebrate the First Anniversary of the Latvian Declaration of Independence. The common design features an allegorical representation of Latvia, holding a sword and shield. The 10 K. denomination stamp shown above, at the top left (Sc. #59), is printed on unwatermarked, wove paper and the size is 33 x 45 mm. The 10 K. denomination stamp shown above, at the top right (Sc. #60), is printed on unwatermarked, laid paper, and the size is 33 x 45 mm. The 10 K. denomination stamp shown above, at the bottom left (Sc. #61), is printed on unwatermarked, laid paper, and the size is 28 x 38 mm. The 35 K. denomination stamp shown above, at the bottom center (Sc. #62), is printed on unwatermarked, laid paper, and the size is 28 x 38 mm. The 01 R. denomination stamp shown above, at the bottom right (Sc. #63), is printed on the backs of unfinished Five Ruble banknotes (blue printing), and the size is 28 x 38 mm. 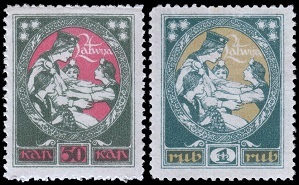 The four commemorative stamps shown above (Sc. #64-67) were issued in December 1919 and January 1920 to honor the forces fighting for the Liberation of Kurzeme (Kurland). The common design features a Warrior Slaying a Dragon. The two commemorative Latvian stamps shown above (Sc. 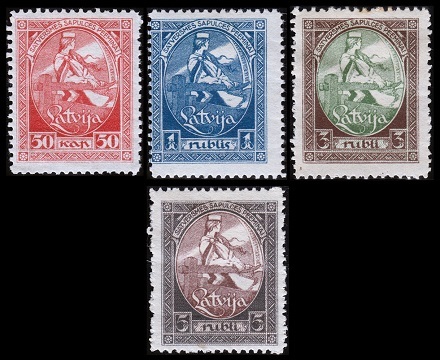 #68-69) were issued in March 1920 to celebrate the Incorporation of the Latgale Province into Latvia. The stamps were printed on the backs of unfinished German occupation banknotes. The common design features an allegorical representation of Latvia Welcoming Home Latgale Province. The four commemorative Latvian stamps shown above (Sc. #70-73) were issued during April and May 1920 to celebrate the First National Assembly. The common design features an allegorical representation of Latvia Hearing the Call to Assemble. 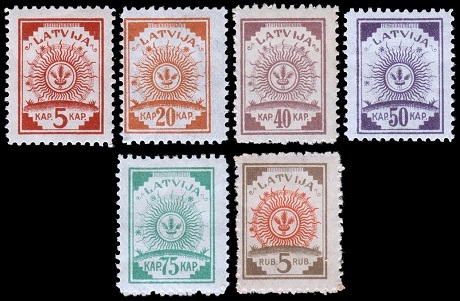 The six Arms & Sun type definitive stamps shown above were issued in 1920 and 1921. The stamps are printed on unwatermarked, wove paper, and they are perforated 11 1/2. 05 K. (1920 - Sc. #76) - Carmine. 20 K. (1920 - Sc. #78) - Orange. 40 K. (1921 - Sc. #79) - Lilac. 50 K. (1920 - Sc. #80) - Violet. 75 K. (1920 - Sc. #81) - Emerald. 05 R. (1921 - Sc. #82) - Gray Brown & Orange.